Butch McIntosh wears traditional Native American regalia at the Pow Wow of Champions on the fairgrounds in Tulsa, Okla. Saturday Aug. 11, 2007. The first European explorers to reach the Americas looked to the Bible to explain the origins of the people they encountered and misnamed “Indians.” Biblical tradition holds that humans were created some 4,000 years ago and that all men descend from Adam — including indigenous peoples whom Europeans regarded as primitive. Indians in Virginia. Engraving by Theodore de Bry, 1590, based on a watercolor by John White in 1585. “And that created an idea that either people were genetically inferior or that there were stages of civilization, and Indians were at a lower stage,” he said. Map of eastern Russian and Alaska with a light brown boarder depicting Beringia, where archaeolosits believe ancient Americans crossed from Siberia into Alaska around 13,000 years ago. Courtesy, U.S. National Park Service. The Meadowcroft Rockshelter in Washington County, Pa., where archaeologists found artifacts dating back 16,000 years. Other branches of science have weighed in: In 1998, University of California-Berkeley linguist Johanna Nichols argued that it would have taken up to 50,000 years for a single language to diversify into the many languages spoken by modern Native American groups. That meant ancient Indians would have to have arrived 19,000 years ago. Geologists have complicated matters by suggesting that the Bering Strait wasn’t passable until 10 or 12,000 years ago. This gave way to theories that early humans might have sailed down the Pacific coast into the New World. Meanwhile, in 2015, Harvard University geneticist Pontus Skoglund discovered DNA links between Amazon Indians and the indigenous peoples in Australia and New Guinea. 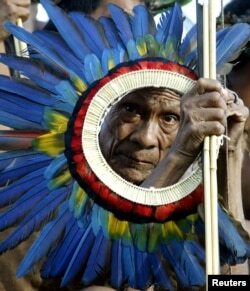 An elderly member of Brazil's Surui Nation. Researchers found the Surui bear a genetic relationship to indigenous peoples of Australia and New Guinea. In the past decade, Smithsonian Institution anthropologist Dennis Stanford met scathing criticism for suggesting Stone Age Europeans paddled across the Atlantic thousands of years before Columbus. In April of this year, researchers in California analyzed crushed mastodon bones they said were butchered by humans 130,000 years ago, a theory the bulk of scientists, including Adavasio, rejects – not because it’s not possible, he stipulates, but because the data isn’t conclusive. Should science consider the origin beliefs of tribes themselves? File--This July 23, 2008, photo was taken from inside the Paisley Caves near Paisley, Ore., where archaeologists found stone tools and human DNA dating back more than 13,000 years, evidence humans settled North America earlier than previously thought. Stories like these aren’t given much weight by science, said Joe Watkins, supervisory anthropologist at the National Park Service and a member of the Choctaw Nation. “But I do believe most of them carry within them kernels of truth of use to researchers. It seems imprudent to dismiss any possible line of evidence," he said.